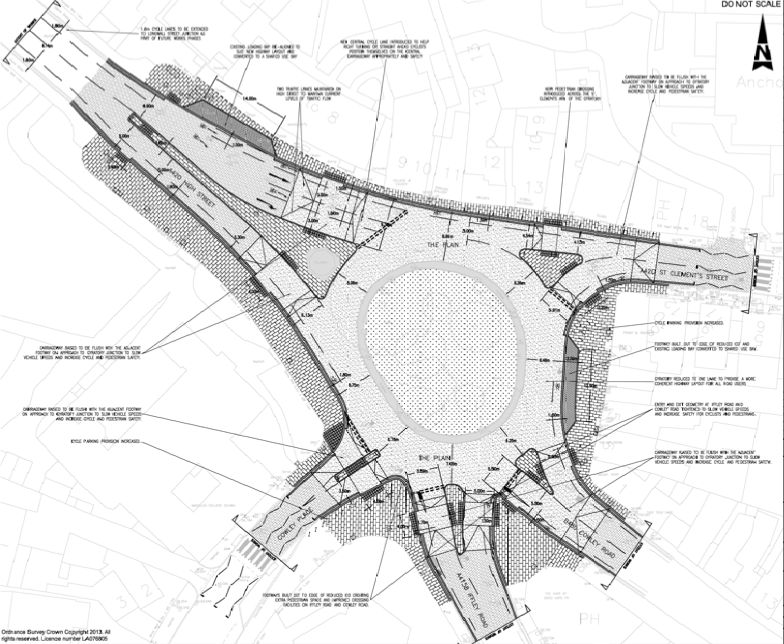 In 2013 Oxfordshire County Council bid for, and were awarded, a Cycle City Ambition Grant to redevelop the Plain roundabout. The Plain is a pretty complicated 5-exit roundabout which lies between the major routes out of East Oxford and the main route into central Oxford over Magdalen Bridge – alternative routes are lengthy detours and/or flooded, depending on the time of year, so the Plain is a pretty key junction. The nearest DfT count, on the bridge itself, shows over 17,000 bikes use this road every day – more than all motor vehicles combined. Basically, it builds out pavement everywhere to tighten up the corners and slow traffic down, and reduces the High Street approach to a single lane, making it easier for cycles to take the right-hand exits. There’s no segregation, there’s nothing but some paint and the hope that making cars and bikes go round together will slow everything down and make everyone happy. It is in fact worse than the original version, as the single-lane approach from the High Street has been ditched to improve traffic flow. Instead there is a centre cycle lane, which does nothing to make it easier to pull out into traffic to turn right, but does give you a special bit of tarmac to sit on between buses. Instead of taking any measures to separate cycles from other traffic, the strategy is to build out pavements a bit, slow everything down, and hope that everyone will co-exist happily. 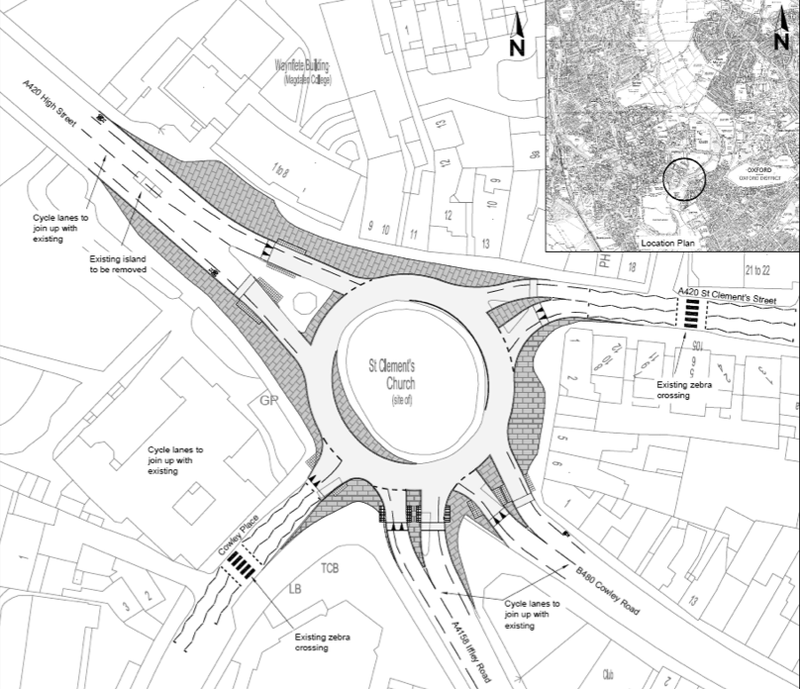 However, given that this scheme is stage one of a two stage scheme (when funding allows) that would address the wider approaches to the junction, the concept of some sort of semi-segregated cycle lanes on the roundabout could be revisited at a later stage. But not on this scheme, which will cost £965,000 for, as far as I can see, some pavement. Honestly, if this is the sort of thing they’re going to do with £965,000, they should give it back. There is one bright spot in this scheme – the plan to remove the cycle exemption on the left turn into Longwall Street is gone in favour of allowing the few cyclists who use it to use a bit of shared footway instead, and they’re going to apply for early-start lights for cyclists at this junction. Of course, the cyclists will then be heading towards the Plain, but at least you get five seconds to get ahead of the buses. But even in a place which is pretty well-designed by UK standards, there are some poorly designed roads. Here’s one particular road which annoys me on my commute every morning, to the point where I wrote this blog post in my head while cycling up it: Morrell Avenue. It starts as a two-lane road with advisory cycle lanes on each side, you sometimes have to play spot the cycle lane but it’s not too bad. Further up, we keep the wide pavements and grass verges, but the cycle lanes disappear in favour of car parking, swapping from side to side. It’s not completely obvious from the street view, but this is a hill, and I’m generally not cycling too fast up it. So I have two options when cycling up Morrell Avenue – I can sit outside the line of the parked cars, going well below the speed of the car traffic even on a 20 limit road so everyone sits behind me.Believe it or not I don’t want to slow down everyone in a car, and it just leads to someone overtaking me too closely anyway. So option 2 is to swing in and out around the parked cars, checking every time that no one is coming up behind me or trying to overtake, hoping they don’t pass too closely when I’m going round the parked cars anyway. Why can’t we get rid of the parking and put in a cycle lane? The houses have driveways, often with room for two or more cars, so there would still be parking for residents. Or if we really can’t do without losing some parking, why not remove one of the grass verges and put in a cycle track? You’d probably have to cut down some trees, which would be a shame, but it might be possible to fit a lane in without losing them, and a cycle track even only on one side of the road would be useful. I would be happier because there aren’t cars inches from my elbow, car drivers would be happier because they don’t have to sit behind and wait for a gap, everyone is happy with the better use of space. And then I reach the top of the hill and head onto Warneford Lane, where they have helpfully painted bicycles in the bit of the road where I shouldn’t be cycling in case someone opens a door on me. Actually, it’s even better – last week they resurfaced the road, or rather they have resurfaced exactly half the road, so the cycle lane is now half shiny new tarmac, half old tarmac, and a neat line of tar in the middle.